President Umaru Yar'Adua has faced growing pressure to transfer power formally to his deputy since leaving Nigeria nearly two months ago for medical treatment in Saudi Arabia. Analysts say Yar'Adua's tight grip on power has slowed government business, threatens a fragile peace in the oil-rich Niger Delta and raises concern about the legality of decisions made in his absence. More than 40 former leading politicians, many of whom are members of the president's ruling People's Democratic Party, said parliament must step in to defuse tension caused by his absence. 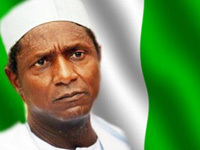 "The situation before us today is that President Umaru Yar'Adua has been out of the country for over 50 days on grounds of ill health," said the petition from "Concerned Nigerians". The group, which included former Senate President Anyim Pius Anyim and the chairman of Nigeria's energy firm Oando (OANDO.LG), Mohammed Magoro, urged parliament to amend the constitution to allow for more flexibility in the handover of presidential power. Under the constitution, the president must write a letter to the heads of both houses of parliament transferring executive powers to the vice-president. A federal court ruled last week that the vice-president could perform all executive duties for the president without a formal transfer of power. Vice-President Goodluck Jonathan used executive powers for the first time on Tuesday by ordering troops into the city of Jos to restore calm after four days of clashes caused more than 460 deaths.